He carries deeply in his core our vision, values and principles. He is	a co-founder and Instructor of Gracie Barra Aclimacao, which is one of	the first GB schools in the biggest city of Brazil, Sao Paulo. The school	has strong and well-known programs for women self-defense and anti-bullying	for children and also coaches a number of competitors with great results	in both national and international tournaments in the sport and potential	champions. As a Professor, Alexandre leads by example with kindness and care. He has	a Strong moral authority built upon his positive, cooperative, and constructive	attitude towards his students and instructors. He understands his importance	on students’ lives as a role model, as well as his responsibility	in bringing out the best each person has within. As a high performance athlete and competitor, Prof. Alexandre values the	lessons that have long been taught by sport Jiu-Jitsu competitions: the	pursuit of excellence through personal development and teamwork, ethical	and responsible behavior on and off the mats, leadership and strength	of character, and sportsmanship – respect for one’s opponents,	acceptance of victory with humility, and acknowledgement of defeat with	grace. He has had excellent results in State, National, and International	competitions and is always giving his best to surpass himself. 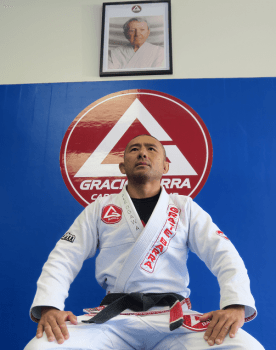 In addition, Prof. Alexandre has a rare ability to recognize potential	instructors and a personal belief that knowledge must be passed on to	enable other people to not only keep Master Carlos Gracie Jr.´s	legacy alive but to give them the opportunity, tools, and support to discover	their own teaching talent and passion for this profession and life style. He inspires his instructors to be as good role models as he is and he	strengthens their growth and development as Jiu-Jitsu practitioners and	instructors.